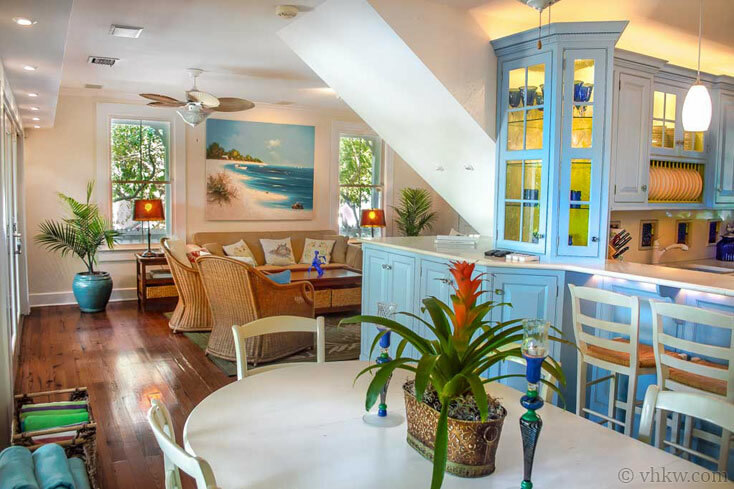 This extraordinary French Caribbean style home, Belle Maison du Port (Fine Harbor House), is available as a monthly vacation rental from May through October. 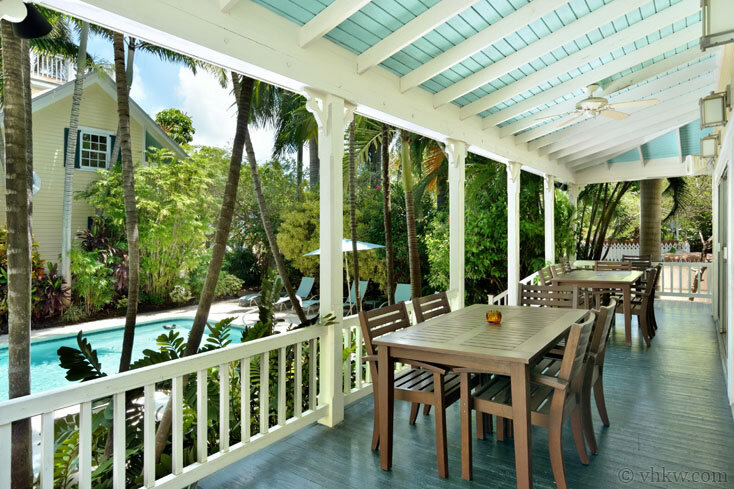 Comprised of a stunningly renovated 2 – Story Victorian home, plus an adjoining one-bedroom guest cottage, this layout is perfect for a family or small group of friends that want a private luxurious vacation rental. 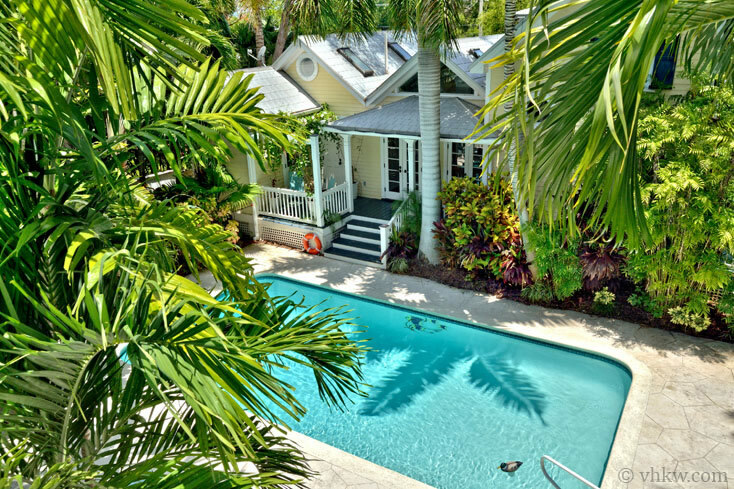 Located right on the Historic Key West Seaport, this house is situated on one side of the grounds of the Seaport Treasure Estate. Only during these late spring and early fall months is it possible to rent this private 3 bedroom 3 bathroom villa by itself, and still have the large estate pool and grounds all to yourself! 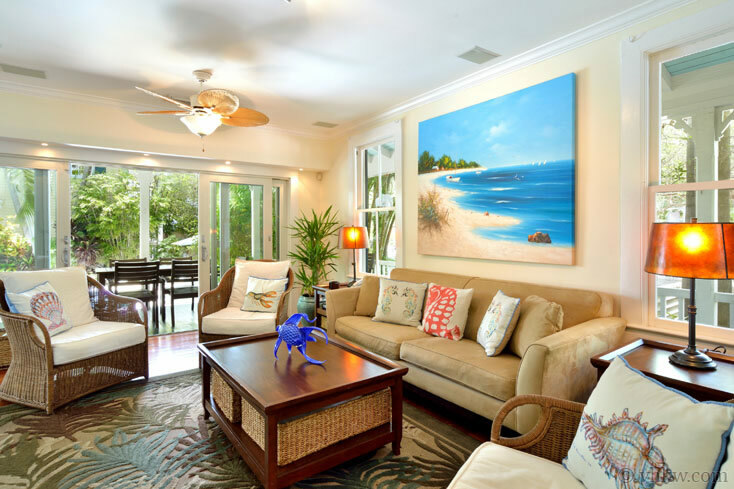 Even with this premier seaport location, this property is the best of both worlds, only 150 feet from the boardwalk, yet impressively private with fencing and mature tropical landscaping. It’s one of those mysterious places that you can walk by, and not even imagine the spacious pool gardens and luxurious home set behind the gates. The main entrance to the home is through tall white wooden garden gates leading to a wide covered porch, which wraps around three sides of the house. 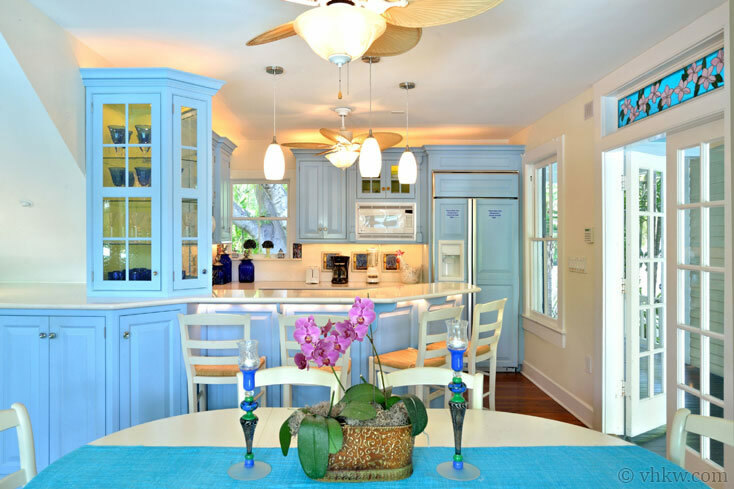 The front door steps from the porch into the casual yet elegant living room; then around the corner, a side door entrance, with a beautiful stained-glass transom window, leads to the French Caribbean blue kitchen. Once inside, you see how the living room and kitchen are all one open concept renovation, designed to create a spacious designer great-room, with a spectacular view of the swimming pool. 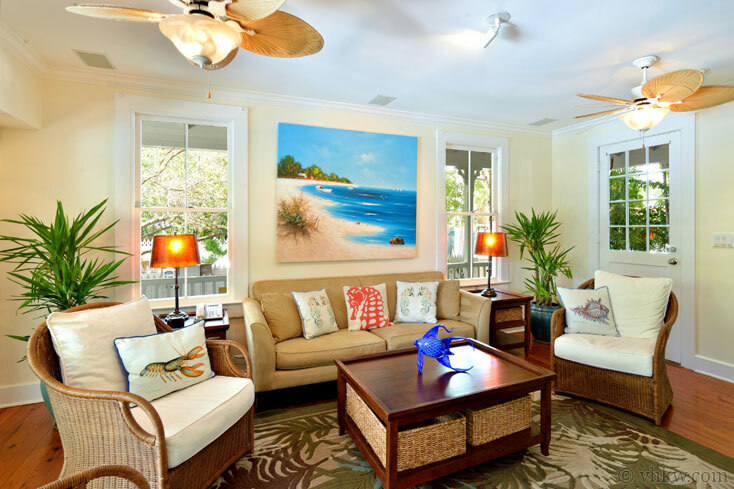 On the living room side or the great-room, décor is soft and subtle, with a sand tone sofa, wicker easy chairs, and island beach art work. A focal point on one wall, is a 42” HD TV with Blue Ray 3D player, providing a multi-media entertainment center. 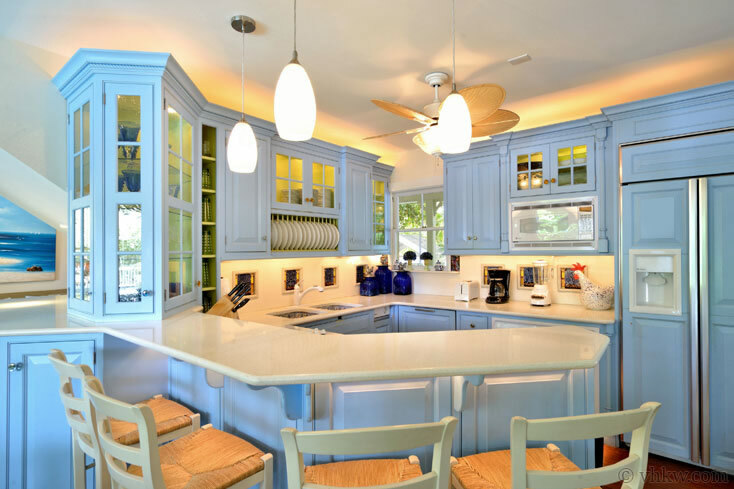 On the kitchen side, bright blue custom cabinets are set against white marble counter tops creating an eye popping contrast. A breakfast counter, designer lighting, and high end appliances, dining table for 6, sets the stage for lively entertaining. Dark hardwood floors, throughout the entire great-room, visually pulls the room together. The great-room has multiple sets of sliding French doors, along the pool side of the porch, providing a complete view of the swimming pool, while you enjoy cooking or relaxing in the living room. Then, when you decide to grill and dine outside, two al-fresco dining tables, which can be set together, are on the covered porch overlooking the pool. At the front door entrance, an illuminated wooden banister staircase, leads upstairs to two beautiful bedrooms. A window at the top of the staircase provides a secret view of Elizabeth Street down below. Both upstairs bedrooms and bathrooms run along opposite sides of the house, offering plenty of privacy from one another. 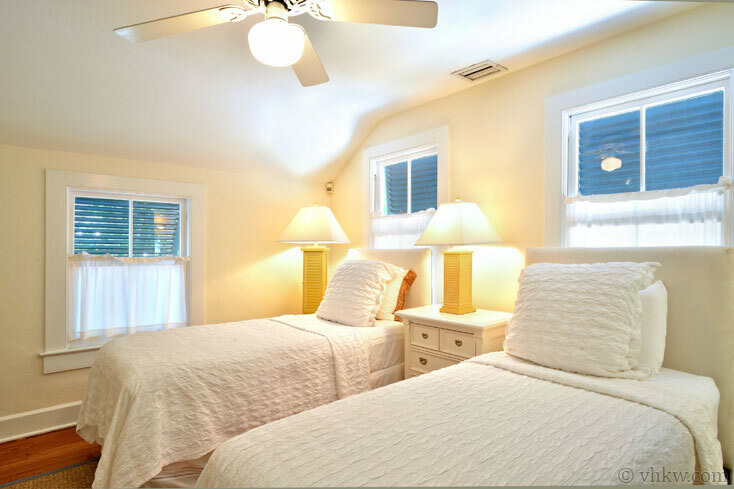 The 1st bedroom, offering a queen size bed, is cheerfully decorated with a soft chenille spread adorned with humorous stuffed-animal Key West chickens to match. A bonus for this bedroom, is a French door leading to a 2nd floor deck. 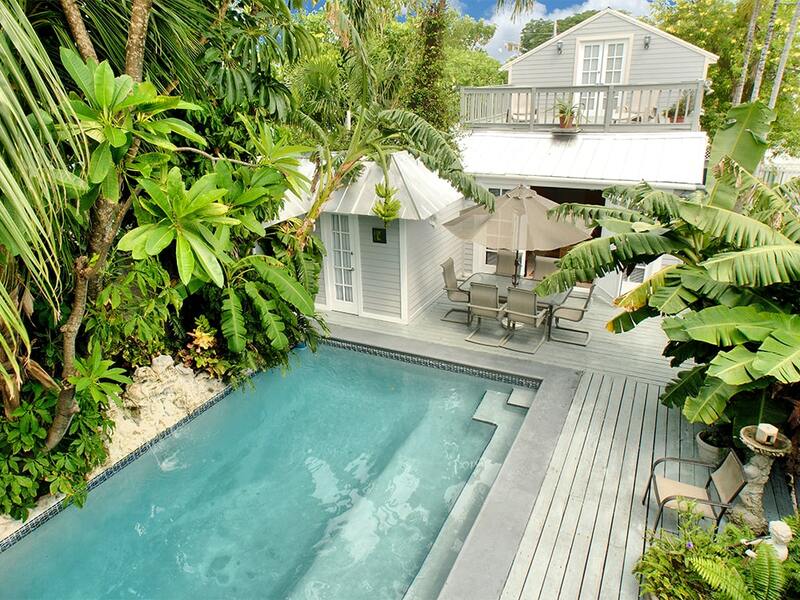 From the deck you get an enviable view of the swimming pool and courtyard below. 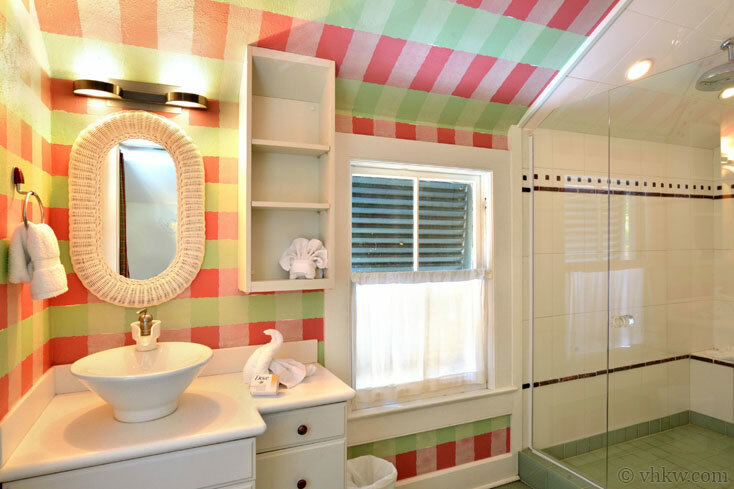 The en-suite bathroom, is artistically hand painted with pink and green plaid walls, which at first glance appear to be custom wall paper. Amenities include an oversize shower for two, frameless glass door shower, and upscale fixtures including a rain head shower-head. The 2nd bedroom, to the left of the stair landing, is decorated softly and minimalist, a quiet contrast to the 1st bedroom. This bedroom provides two twin beds (that can be put together to make a king size bed); both are shown dressed with white fabric headboards and soft white chenille spreads. 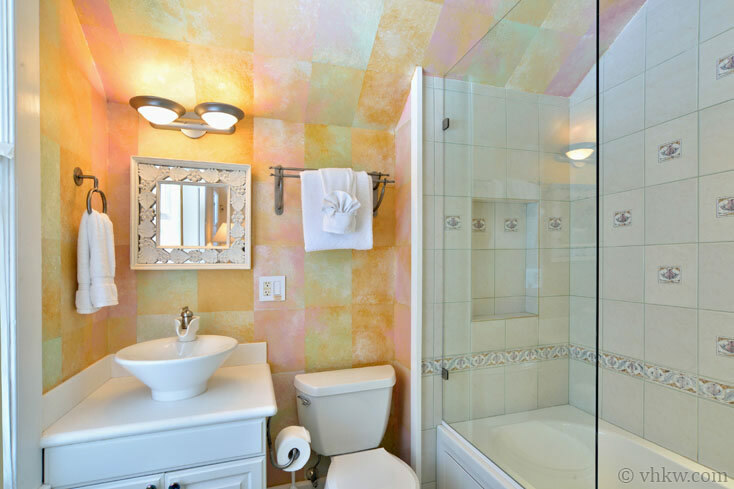 The en-suite bathroom for this bedroom, also displays unique hand-painted ‘wallpaper.’ But this bathroom also provides a soaking tub with in-tub shower. Custom lotus-flower designer tile, a white round vessel sink, elegant bath fixtures, and an exotic white Balinese framed mirror complete a peaceful setting. Back downstairs, it’s not readily apparent that the 3rd bedroom is a guest cottage with en-suite bathroom stands on its own. You may need to flip a coin for who get this private guest cottage bedroom. 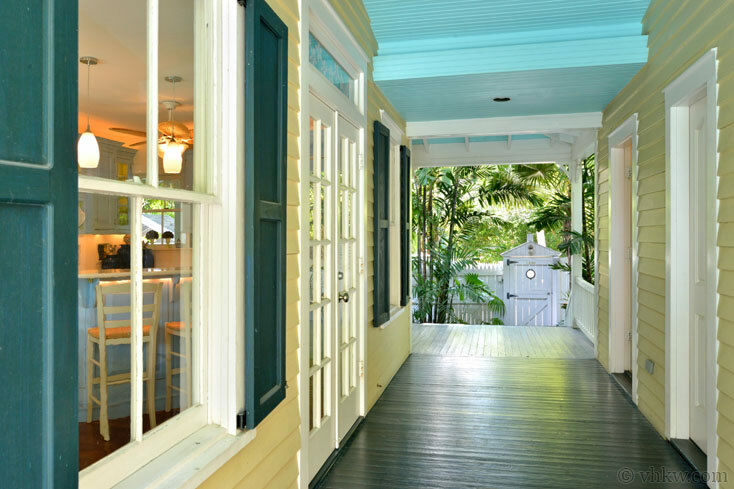 Seamlessly connected through French doors off the kitchen side, the covered porch hallway, creates just enough separation to make it ideal. Styled to feel grandly spacious with open beamed ceilings painted bright white, an exclusive feature of this bedroom are French doors leading to a private porch and the poolside courtyard. 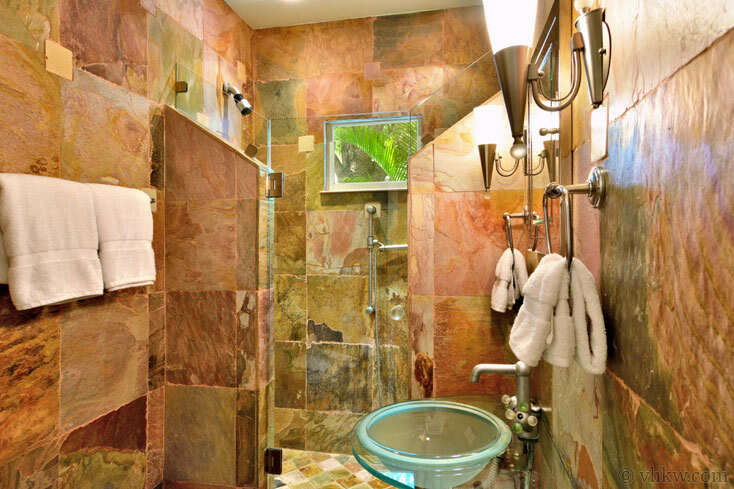 Décor is tropical sunny and crisp, with bright white wood furnishings, built-in book cases, hardwood floors, and soft window and bed dressings The luxurious en-suite bathroom has a large walk-in shower, clear glass vessel sink, travertine tile, and designer bathroom fixtures. On the same side of the house as the guest cottage, are two additional welcome features. These include a conveniently placed half-bathroom (with sink and commode). 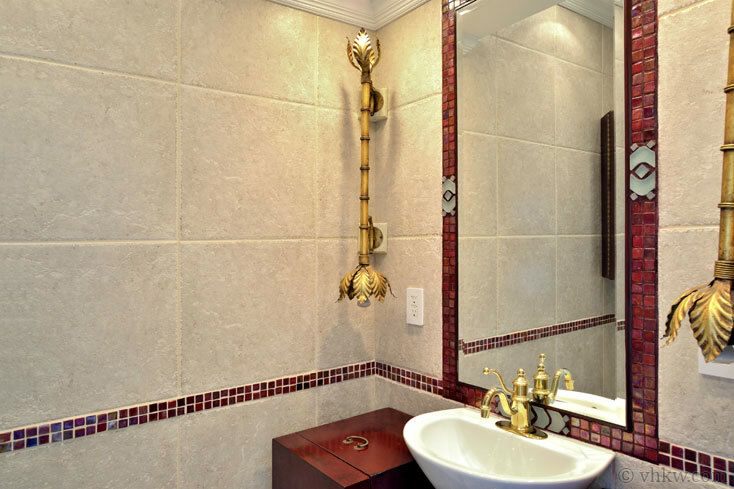 Decorated with a touch of India, fanciful gold and bamboo light fixtures and cut glass milk-white tiles, make a space to behold. The multi-purpose utility room, also serves as a pantry, and has an extra full-size refrigerator, which is always useful. 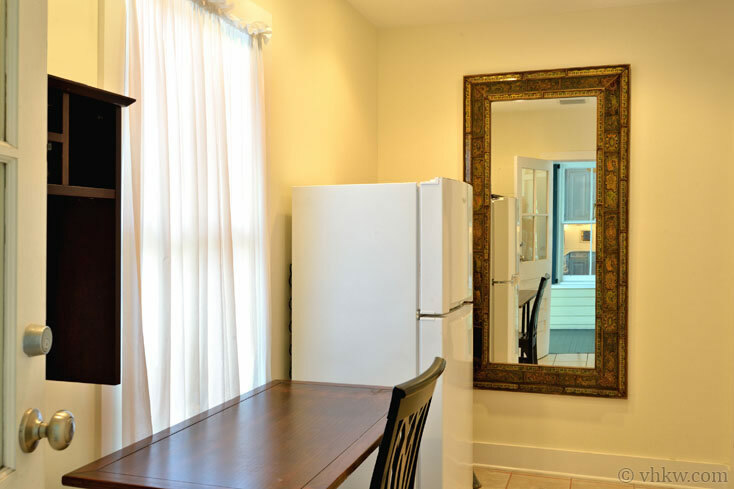 A full length mirror makes it a convenient dressing room, complete with a table desk making it a private place to use your lap-top. The focal point of the grounds, is the resort-style swimming pool courtyard in the center of the property. 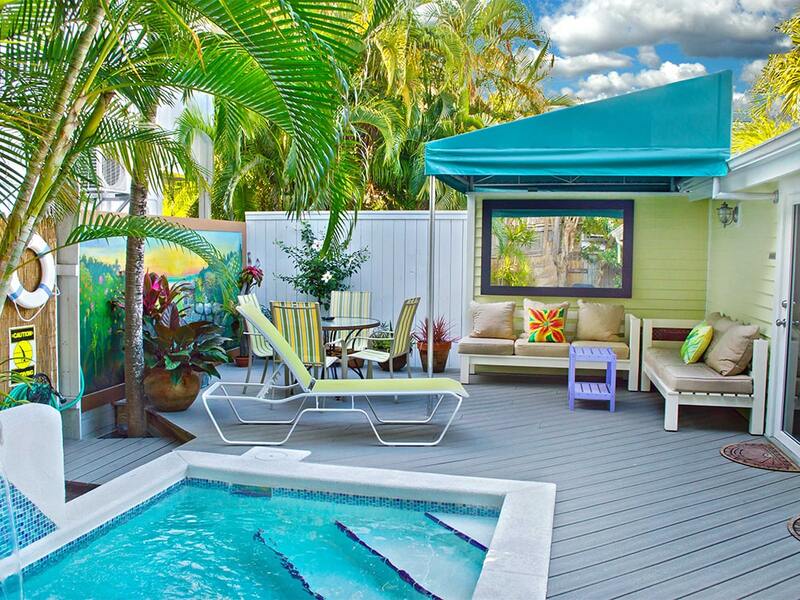 The swimming pool is large, by Key West standards, and the concrete deck surrounding the pool set with chaise lounges, creates a private resort feel. 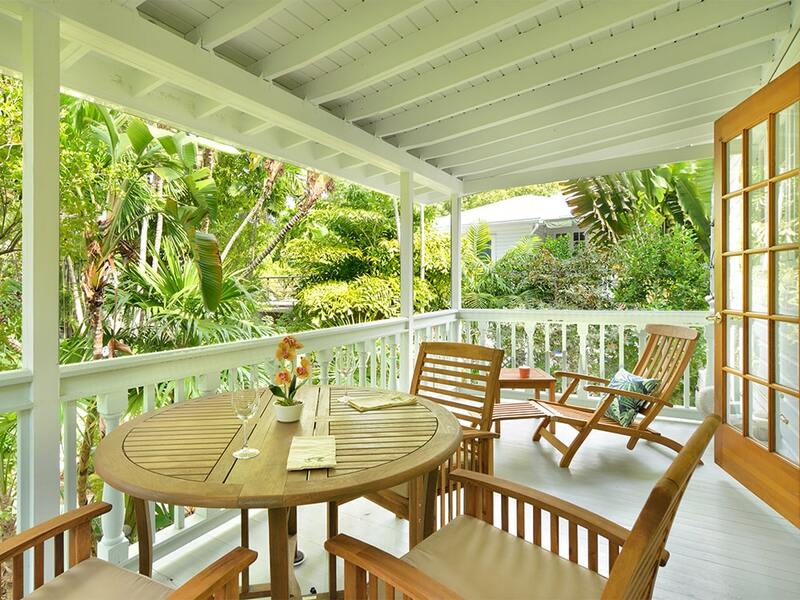 The property is surrounded by lush mature tropical landscaping to create nearly complete privacy from the street. A covered porch wraps around three sides of the house. 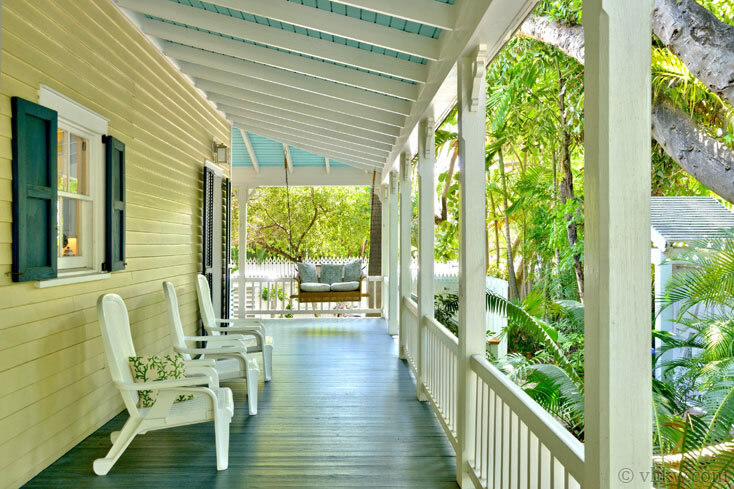 A porch swing is a nice added feature for rest and relaxation. When you rent the Bell Maison du Port, you enjoy the complete grounds and pool all to yourself. The second house on the estate grounds, is unoccupied. Amenities: Gated estate property with large swimming pool, spacious pool courtyard with lush mature tropical gardens, expansive wrap around porch, 2nd floor deck, and privacy fences, BBQ grill. Fully equipped gourmet kitchen. 42” HD TV with Blue Ray 3D player, plus cable TV’s in each bedroom. Separate laundry room. Central a/c and heat. Wi-Fi internet throughout the property. Linens and towels are provided. Laundry service available. Catering can be arranged. Maid service can be scheduled. 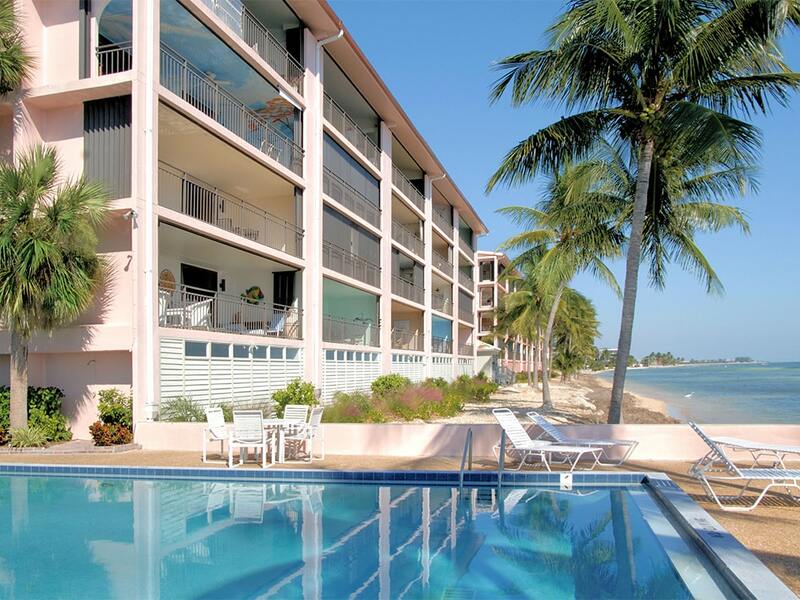 Activities: Less than 150 feet from the boardwalk and the docks at the famous Key West Historic Seaport. 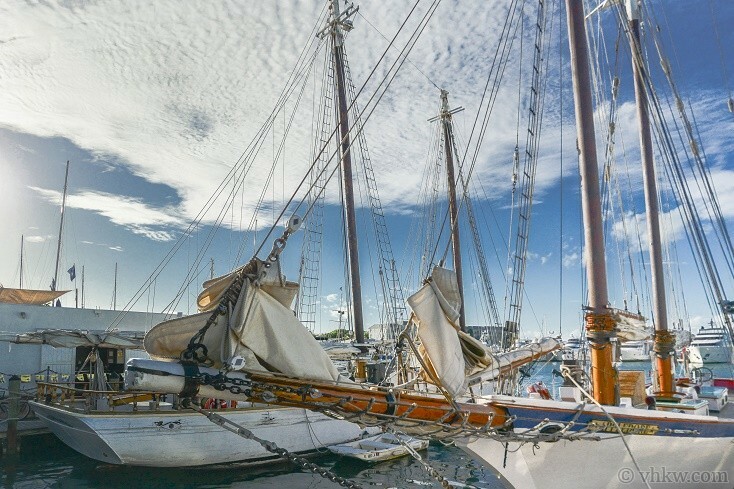 Stroll along the water and enjoy the tall wooden ships and the charter boats. 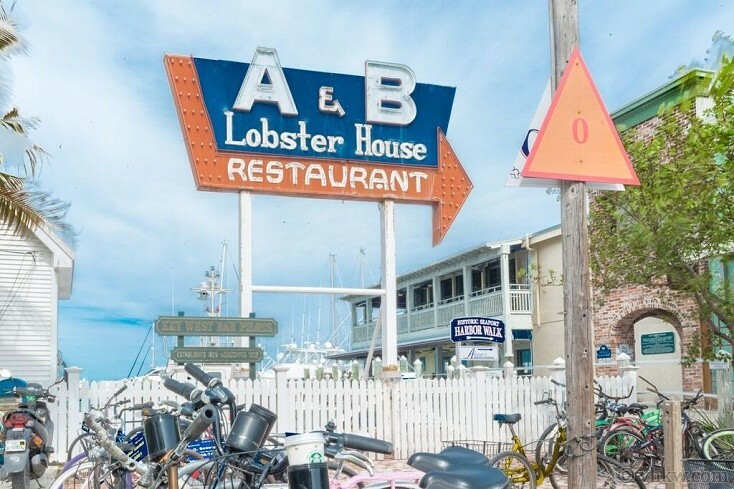 Enjoy famous waterfront bars, including Schooner Wharf Bar and Turtle Kraals, and eat at the A&B Lobster House and Conch Farm, all steps from this property. 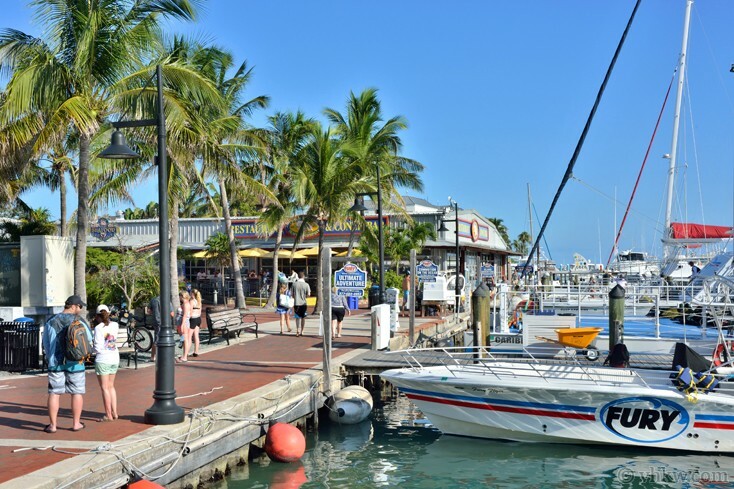 Short walk to the Mallory Square Sunset Celebration, and unique local Old Town Key West art galleries, and one-of-a-kind retailers. 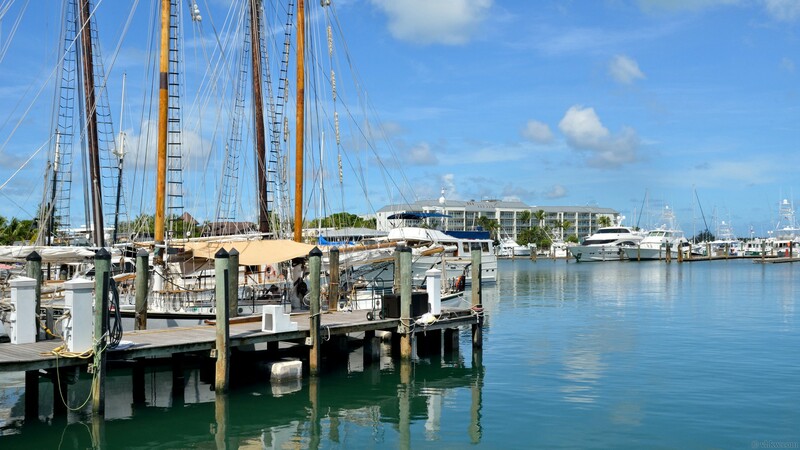 Close to live music entertainment and nightlife, steps to water sports adventures including sailing, boating, fishing, and diving. 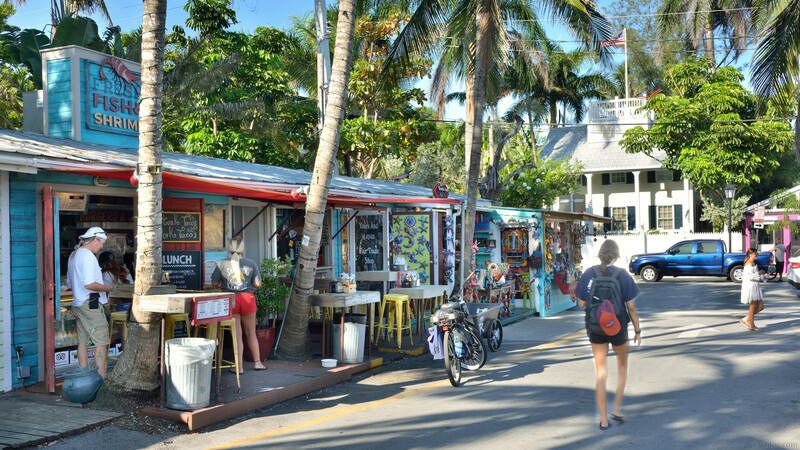 Close to variety of national and international restaurants, Cuban coffee shops, candy stores, ice cream, most anything your heart desires. 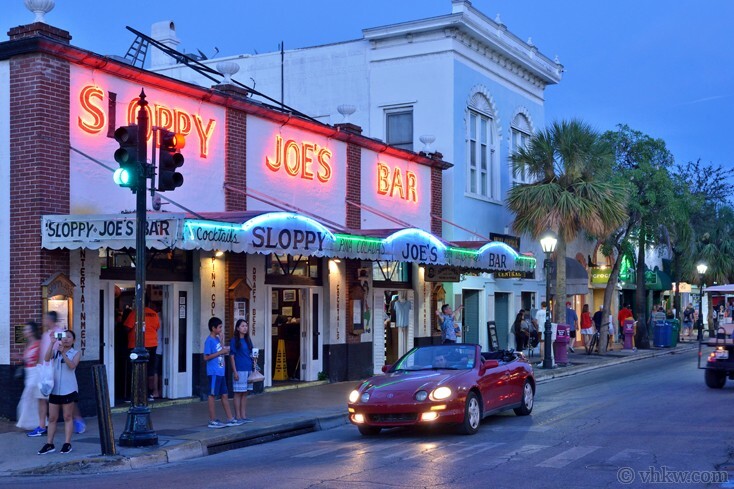 Area: The famous historic Old Town Key West waterfront, on the gulf side of the island and the original lower Duval Street area, encompasses this original Historic Seaport neighborhood. Settled by seafaring adventurers and pirates of the late 1800's, when the first shipping docks, warehouses, restaurants and wooden homes were built. 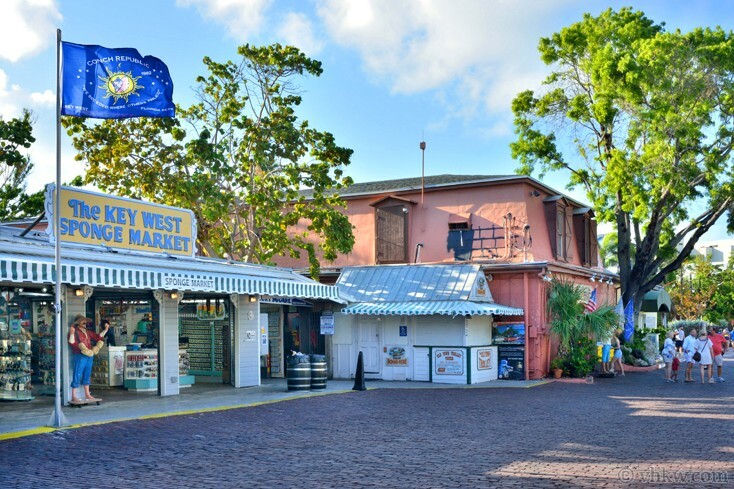 These one-of-a-kind historic buildings stand steadfastly as a treasured testimony to Key West’s colorful past. 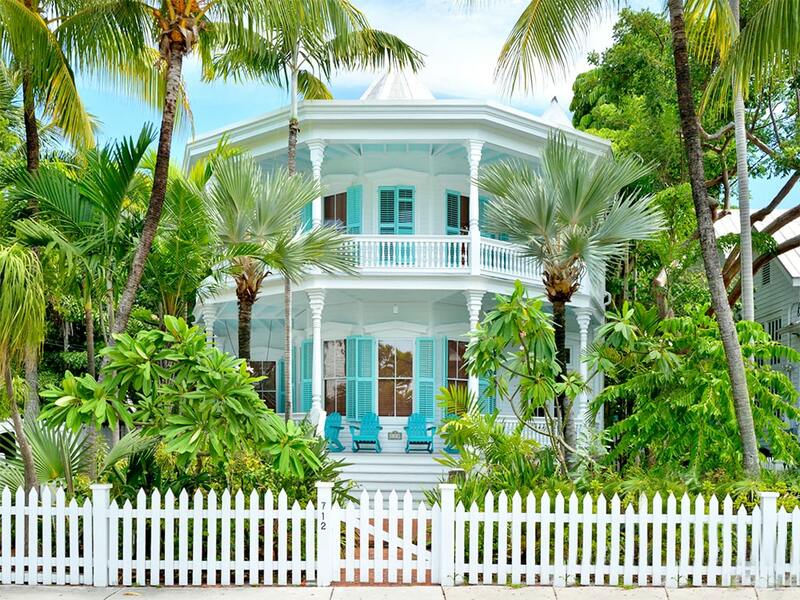 The Historic Seaport neighborhood of Key West holds of the largest and most impressive collection of turn-of-the-century architecture in the U.S.A. From larger Victorians to charming shot gun cottages, most of these incredible structures have been restored and renovated to stand as in their gleaming glory of yesteryear. Parking: Off-street parking is available on a gated driveway next to the house. If you bring a car, enjoy walking or biking everywhere once you’ve settled in. From here, you won’t really need a car in most instances. Restrictions: This is a SMOKE FREE house. Pets are generally not allowed, but special consideration may be made at the sole discretion of the owner and agents, with an additional pet fee. Please note that sneaking pets in to the property can result in eviction. This property will ACCOMMODATE 6 PERSONS MAXIMUM. We do not accept guests less than 25 years of age unless accompanied by a family group or guardian. It is not suitable or licensed for staging an event such as a wedding or large gathering. We would be happy to direct you to facilities that can meet these needs. 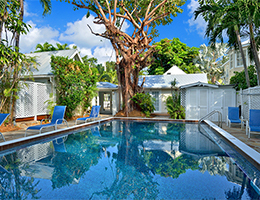 Notes: The design of this exclusive Old Town Key West estate home is intended for a family, professionals, and executives who are looking for a private home with Quality Amenities. 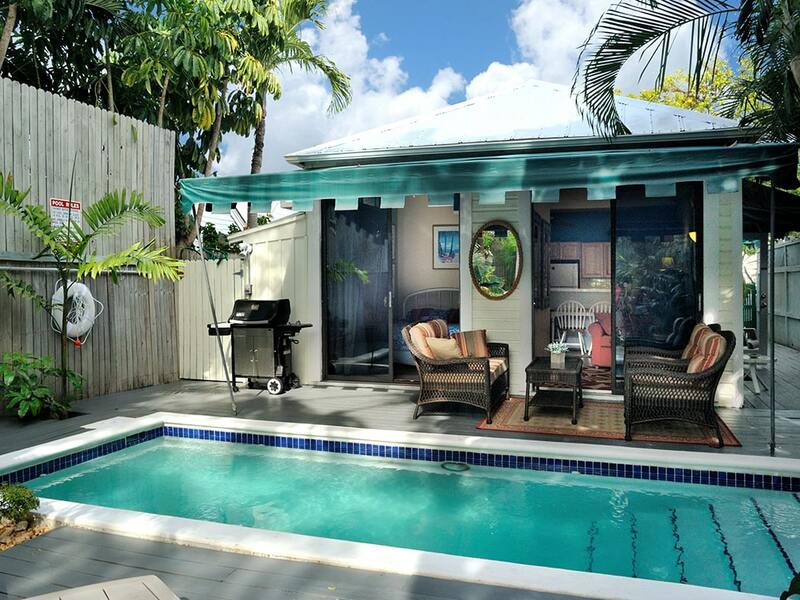 It is suitable for sophisticated individuals with discerning tastes looking for the very finest Key West has to offer. 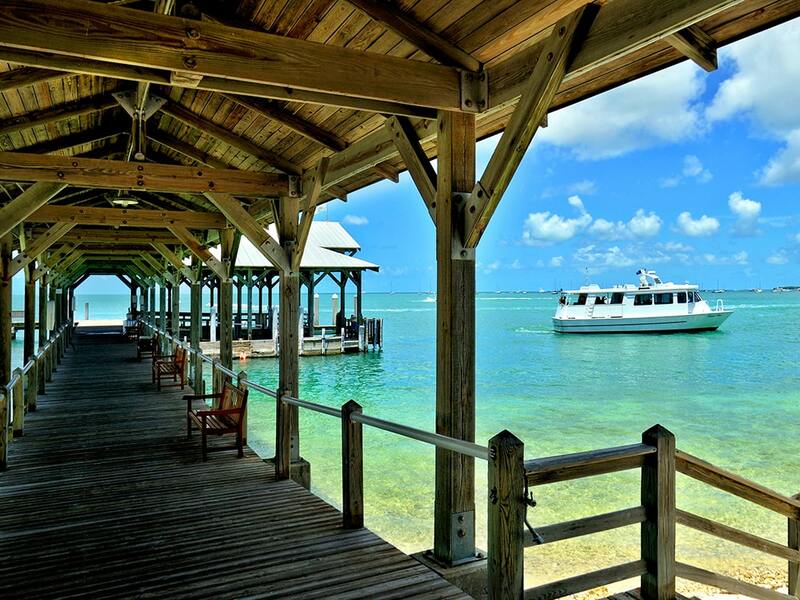 Note: If you decide to add more than 6 to your guest list, you can rent the entire Seaport Treasure Estate.